If you’ve caught up with me lately chances are you’ve heard me rabbiting on about WordCamp. WordCamp is an informal get together of WordPress users and developers that’s being held during 21-21 of July 2012 in Sydney. It’s 2 days of WordPress heaven, bought to you by some of the most knowledgable WordPress folks around. There are talks covering a wide variety of topics, make sure you check out the speakers and sessions. 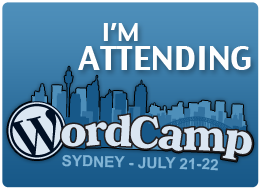 You can read all about WordCamp at the official WordCamp Sydney 2012 website. I’ve been to the Melbourne WordCamps and both times I’ve met people I’m still in contact with today. If you love your web, and if you love your WordPress, you’ll definitely love WordCamp. I highly recommend going if you can make it and I hope to see you there! If you’re already going and want to pitch in and lend a hand, make sure you check out the Call for Volunteers. With the help of a few friends, I’ve started up free WordPress training workshops in Australia, along with a website called wpsupport.com.au. So far we’ve only held the workshops in Melbourne, but we’re in the planning stages of holding a few sessions interstate and in various regional areas (Bendigo being the first already in the pipeline). Currently we’re holding beginner sessions (WordPress 101) and intermediate sessions (World of WordPress), but we’re also looking at holding afternoon sessions where people can just bring their laptop and work on their WordPress sites in informal groups. If you’d like to know more about the WordPress workshops, visit wpsupport.com.au. Sign up to the email list at wpsupport.com.au, follow us on Twitter or Like us on Facebook if you’d like more information on upcoming events. If you have any spare IT gear laying around gathering dust, donate it to the Queensland Floods IT Relief Programme. Currently the only drop off point is at 17/160 Lytton Road, Morningside in Brisbane but points in other states should be listed shortly. A while ago I came across twill whilst working on a testing project and thought others may also be interested. twill is essentially an open source web testing tool written in Python. twill allows you to browse the Web from a command line interface. twill supports cookies, forms and most common interactions. For more information visit http://twill.idyll.org. If you can afford to do so, please donate generously to the victims of the Victorian bushfires. OurCommunity has several options for donating. The 2008 SAGE-AU Victorian IT Symposium is a one day technical conference held in Melbourne. It is organised by the SAGE-AU Victorian Chapter and aims to provide an educational forum for systems and network administrators, system managers, developers and other technical professionals to meet and share their knowledge and experiences. This is the fifth year running for this event, focusing on a providing a fast paced stream of technical presentations. The 2008 SAGE-AU Victorian IT Symposium is proudly supported by our Gold Sponsors Red Hat, EMC Corporation and Total RISC Technology. First Melbourne Flex User Group Meeting – OzFlex Unleashed! I went along to the first Melbourne Flex User Group meeting tonight, OzFlex. I must say it was exciting to see the enthusiasm of some of the local developers in building a community that focuses on RIA. The presentation by Matt Johnston walked through a simple AIR application highlighting the native menus and the file system API. If you’re working with Flex and interested in presenting, get in touch with Matt. The local Adobe User Group is canvassing Aussies about the possibility of a Flex event in Melbourne. Adobe Platform Evangelist Danny Dura will be in Melbourne in late January so there is a strong possibility that there will be a Flex/AIR night meeting. The planned date is Tuesday the 29th of January, 2008. The Open Source Developers’ Conference 2007 is a conference designed by open source developers, for developers and business people. It covers numerous programming languages across a range of operating systems, and related topics such as business processes, licensing, and strategy. Talks vary from introductory pieces through to the deeply technical. This year, the conference travels to Brisbane and will be held at the Royal on the Park Hotel (opposite the City Botanical Gardens), aiming to further build on the huge success of OSDC 2004-2006 in Melbourne. OSDC 2007 expects to welcome over 200 delegates. Early bird registration until October 14th! With three developer talks on at any time, spanning over the three days of the main conference, and the tutorials on the Monday before the main conference, there is bound to be something of interest to any developer. A new fourth track is dedicated to the business related topics and is sure to attract many additional interested parties. The theme for this year’s conference is “Success in Development & Business”. An overview of the confirmed sessions is online, the program scheduling will be made available soon. The 2007 keynote speakers will be: Rusty Russell (opening), Rasmus Lerdorf, Paul Fenwick (dinner), and Nat Torkington (closing)! OSDC 2007 will be held in Brisbane on November 26th-29th. For more information visit http://osdc.com.au. The MySQL User Group is well and truly alive in Melbourne, so make sure you enter this one in your calendars. This months meeting will include a presentation on MySQL via JDBC and an Overview of MySQL use in Australia. For users, administrators and developers using MySQL. Anybody doing anything in this area is welcome to come along! You’re also welcome to speak! Even if you’re just curious about the technology. 1. Introductions and general discussion. A Call for Papers for the OWASP Australia Security Conference 2008 was posted on the OWASP Australia list today. This event will be the first of its kind in the Asia-Pacific region, so I’m sure it will be an exciting event. The conference will be held in February 2008 on the Gold Coast in sunny Queensland, and will cover a wide range of web application security related topics.